Send your photos, comments and letters to ppp@hpr1.com and we will include them in this tribute page. You can also leave your comments at the bottom of this page. 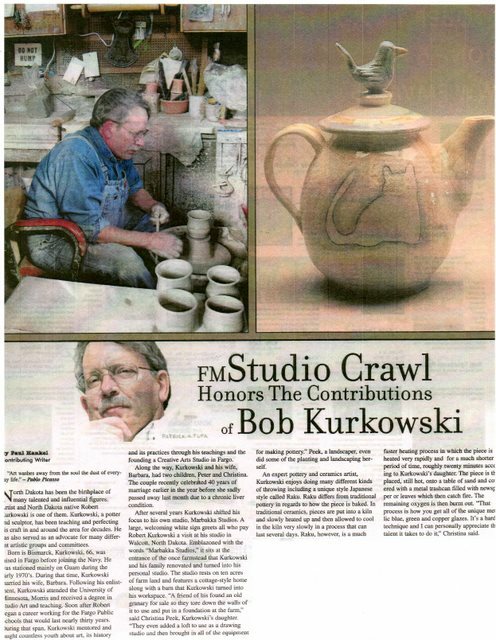 This week’s editorial took a surprising and sad turn Monday night when local artist and military veteran Robert Kurkowski died, so it will not read like originally planned. We had intended to write about care for veterans, with references to three vets, including Kurkowski. Sean Alexander Dacus, 31, Grand Forks, committed suicide Nov. 29 outside Altru medical center. A veteran who had served tours of duty in Afghanistan and Iraq, Dacus scripted messages on his body, “Do not resuscitate,” and “Donate organs please.” His suicide raised many questions in our mind, mostly about the care we provide our veterans. His military service included time near Abu Ghraib Prison, right outside Baghdad, during very intense combat. He was in the Second Brigade Second Battalion’s, which suffered a dozen deaths there in Iraq, two of them members of Alpha Company with Dacus. He had earlier served a tour of duty in northern Iraq. We are left to speculate whether Dacus was receiving adequate care after coming back to society and after traumatic tours of duty in times of war, serving our country. He had enlisted after 9/11. Recent news reports indicate that a U.S. military person commits suicide every 36 hours. Further, though only 1 percent of our population has military service, some 20 percent of our country’s suicides are former military personnel. Couple that with post traumatic stress, depression, alarmingly high medication rates, alcoholism, drug use, homelessness and unemployment, we have a formula for tragedy. It’s sad beyond words. What we really need is a zero tolerance policy ag ainst letting this happen to our veterans. Another vet we know, and will not name in this editorial, who lives here in our community and who suffers debilitated health due to Gulf War Syndrome, is a vocal advocate for medical marijuana. Bear in mind, he was told for numerous years that his deteriorating health was in his mind, that it had no connection to his wartime service. The Veterans Administration Hospital, we understand, tests him for THC, and he lives under that threat constantly. Zero tolerance, don’t you know. That’s not only sad, it is mean spirited. Then there’s Bob Kurkowski. HPR readers may recall that Kurkowski was our cover story September 29. 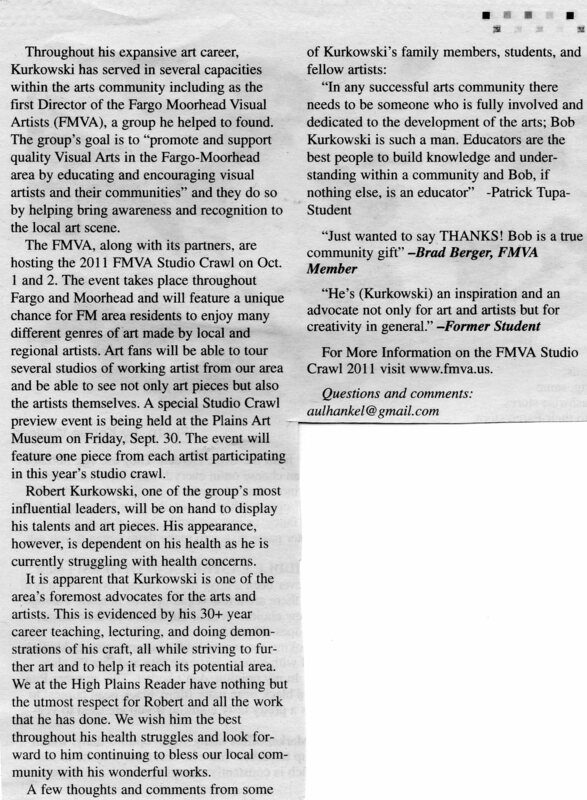 Bob was a huge figure in the local arts community, had been an employee of Fargo Public Schools, was a founder of the Creative Arts Studio, and was a Navy veteran serving our country’s military in Guam in the 1970s. He had enlisted for four years of service the day before his 18th birthday. So, to get to the point. On Bob’s 67th birthday, Nov. 30 (the day after Dacus’ death, mind you), he asked an artist in town track this writer down. We connected via telephone. He then explained what was going on, that he was slated to go to federal court in Fargo Dec. 21 for charges and a $525 fine assessed him while he was a patient in the Veterans Administration Hospital here in Fargo. Bob had terminal cancer. At the time of our visit, he had a tumor on his right side that was paralyzing his right arm. He had no more than six months to live. He was planning his death, while living the best he could until then. Some artist friends of his brought him a gift while he was in the hospital: a bottle of Scotch. The gift was unopened. We won’t name the artists; however, do know it was a gesture of love and friendship. The Veterans Administration brought charges against Bob for possession of alcohol in his hospital room on Sept. 30. Zero tolerance, don’t you know. Bob explained that he was going to federal court and he was going to fight it, that it would be his final battle, and that he was going to ask for a court-appointed attorney and a jury trial. “It gives me something to live for,” he said. But that won’t happen. Bob died Monday night. Another sad ending for a vet who deserved more. We have such pathetically screwed up values when it comes to how we treat—or do not treat—our veterans of war that it begs compassion and change, and necessarily so. We send people to war and when it comes to caring for them after they get back, we let them down. We are blind to their needs, their personal challenges assimilating back into our world, their hurts and injuries, their needs and their wants, seen or unseen. Yes, we have a Veterans Administration system to do the best it can do. But it’s obviously not enough. As a society and as a culture, we need to raise the bar. We need to deliver more to our service men and women. We need to respect and honor, care and nurture, help and love. We need to be cognizant and to open our eyes, as well as our hearts and our pocketbooks. Otherwise, we fail and some poor souls pay a price, the greatest price of all, with their dignity, their self esteem and their self worth, too often with their own lives. Godspeed, Sean Alexander Dacus and Robert Kurkowski, and God rest your souls. And God help the rest of us, because we obviously know not what we do, or don’t do. He was a very special person and I am proud to have known him as a friend these past 30 plus years. You certainly can use my name. It does seem such a shame that, while his was fighting for his life, he had to have the additional burden heaped on him by a bureaucrat. Mary and Roger Goettsch. 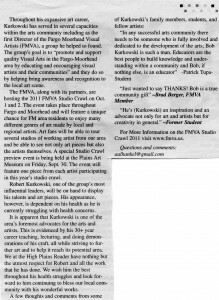 I appreciated John Strand’s guest editorial of 12-15-11, which took note of my late brother-in-law, the artist Bob Kurkowski, and his in-patient experience at the VA Medical Center in Fargo. It was too bad that the VA charged Bob with having a bottle of Scotch in his room. He himself had not “imported” it and was ready to make his case. But Strand’s suggestion that the matter typified what military veterans have to go through at the hands of the VA is misleading. There was one procedure that my late sister and I questioned. In retrospect, I think we were right. However, the decision to undergo it was Bob’s, not the VA’s or ours. The Scotch-in-room charge was Bob’s only issue with the hospital, where he was treated ably, civilly and with compassion. Now public focus should be on the art of Bob Kurkowski. His fine pottery had and has a market. Its rarity increases by the minute.